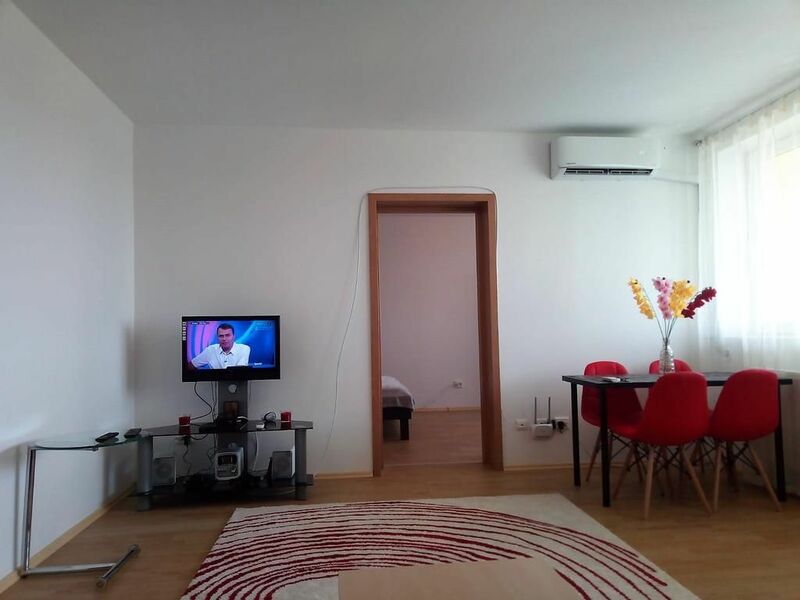 Located in Bucharest, 3.1 km from Giulesti Stadium - Valentin Stanescu, Mill Lake Apartment provides a living room with a flat-screen TV, and free WiFi. The property is 3.3 km from RomExpo Arena. The apartment features 1 bedroom, a living room, a dining area and a well-appointed kitchen. The air-conditioned apartment also offers a bathroom with a bath. Carrefour Orhideea is 4.1 km from the apartment, while Dimitrie Gusti National Village Museum is 4.3 km from the property. This is a non-smoking apartment, but the large balcony should make you feel quite welcomed if you enjoy smoking outside. Please note that for a check-in after 20:00, there is a 10 EUR late check-in fee, payable in cash at the moment of the arrival. For a smooth check-in, please let me know if you'll have any delay. The bedding and other supplies are for convenience and use of our guests. They belong to and must remain at the premises. Any damage or blood stain to the bedding, furniture or other essentials will be charged. A rather strange request, but living in Bucharest, a beautiful city, but a city that needs still to improve its streets cleaning system, makes it almost mandatory to kindly ask you to leave your shoes in the entryway, after you enter the apartment. It's for your comfort in the first place - as I am sure you wouldn't want either to carry dust and bacteria from the streets in the space you sleep, eat or relax - and in the second place, for our comfort after you leave and we need to clean the apartment to welcome the next guests. Thank you! I hope you will feel Welcome, and you will start to love Bucharest. Bogdan’s apartment is located in București, Municipiul București,Romania. Giulești (Romanian pronunciation: [dʒjuˈleʃtʲ]) is a neighbourhood in northwestern Bucharest, in Sector 6. The Giulești Stadium, Giulești Theatre, Panait Sarbu Hospital - Giulesti Maternity Hospital ,Podul Grant, Chiajna Monastery are located in Giulești. Also, the Giulesti Park, Crangasi Park and Lacul Morii are located nearby. Shopping Centers near by : Auchan Crangasi, Carffour Orhideea, Afi MallCotroceni , Plazza Mall Romania. What you can visit in Bucharest : -The Palace of the Parliament - The Romanian Peasant Museum - Historic Center: buildings built in neoclassical and neo-baroque style, numerous attractive terraces, cafes, restaurants and shops. - Herastrau Park: you can ride a boat, boat or water bike, play tennis - Arc de Triomphe. - National Museum of Natural History Grigore Antipa - National Military Museum Getting around Trams 11, 44 and buses 162, 163, N110 stop right in front of your house, metro stations are a few minutes away from your home. Taxi station about 350 meters.